(SPOILERS) What if Michael Myers were a personable young man with excellent manners and piercing blue eyes? Would you let him in your family home? That’s at least part of what director Adam Wingard and writer Simon Barrett are angling for in this blackly comic ‘80s genre binge. The Guest is a well-made little B-movie, and has been audibly embraced by film geeks and critics alike. I wanted to like it more than I did. It is certainly, like a great many (too many?) movies at the moment, upfront with its influences, but it isn’t as rapier sharper as its knowing tone suggests. It’s engagingly absurdist psycho fluff, but Barrett and Wingard only occasionally rise above the tropes and references they’ve borrowed wholesale. Ex-marine David Collins (Dan Stevens) shows up at the door of the Peterson family, claiming to have served with their deceased oldest son Caleb. He tells them he was with Caleb at the end, that he wanted David to check on them all, make sure they are okay. With smooth certitude he wins over even the less certain family members, and before long he is sorting out school bullies and securing dad that promotion he needs. In an ultra-violent manner. 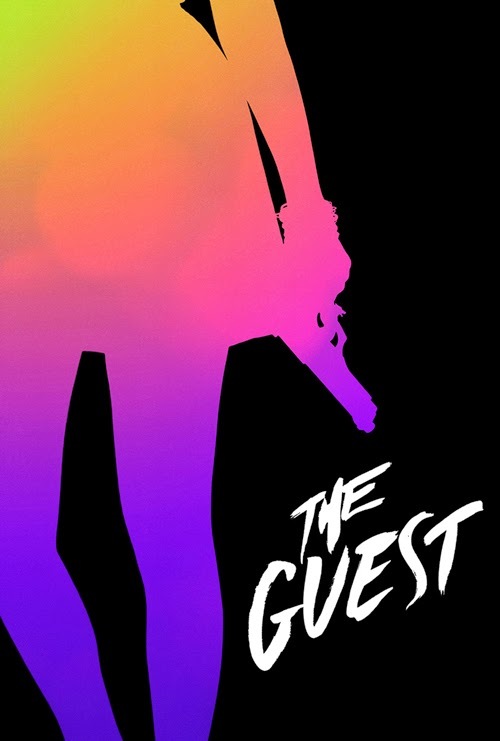 The first half of The Guest is a sly riff on ‘stranger comes to town and sets things right’ movies. We’ve seen this in everything from westerns (Shane) to broad comedies (Uncle Buck), and there’s wit in the way David inveigles himself with the family with his “aw shucks, ma’am” politeness. But Wingard and Barret know they hold some good cards, and can’t resist getting over-excited and showing their hands. They’ve talked about how they wanted to start the picture off seriously and gradually expose its humorous side as they progressed, at which they are reasonably successful (a few rocky section aside). Yet it’s always clear that they are playing with genre conventions. The soundtrack pulses with the ominous thunder of a horror movie from the first shot. Pumpkins announce the Halloween setting and a synth score inhabits a milieu decades past (Steve Moore’s score is a perfect throwback, but overwhelms the picture at times). The family woes (grieving wife, beleaguered husband who drinks to much, daughter with a drug dealer boyfriend, younger brother bullied at school) are instantly familiar. And when David is alone, his face becomes an impassive mask announcing an agenda beyond simple benefaction. The idea that John Candy might turn out to be a knife-wielding (or golf club wielding) maniac holds a certain mirth, and Stevens, buffed up to his eyebrows, hits the tone perfectly. He confidently treads the line between guileless and intense (the scene where he is preparing lunch, playing with an extremely large kitchen knife as he explains himself to the now slightly suspicious family is masterfully edgy) and crosses to either side as necessary. When the violence breaks out big time, he carries the casual air and immaculate manners of one used to such nuisance; Grosse Point Blank (another ‘80s nostalgia piece) comes to mind, high school warfare played with wink and a grin. But Wingard doesn’t quite nail it, and the script is a tad too eager. David taking down the high school bullies in a bar is classic material, but I found it slightly off. The spoilt teenagers react with the “movie” moves of a gang of street punks, and the results feel over-telegraphed (the short, sharp shock of Bad Santa was a far better cure for bullying). In contrast, David’s persuasive tone as sly manipulation of the headmaster when Luke (Chloë Moretz lookalike Brendan Meyer) is due to be expelled hits a more satisfying balance. Wingard and Barret clearly feel compelled to cut to the chase, and the reveal that the military are after David, whoever David is, comes in a rush of half-exposition and a couple of SUVs posing as an entire SWAT team. David’s true identity is left intentionally vague, along with the military test programme from which he has escaped a week before. We know he isn’t the real David (both Luke and Lance Reddick’s Major Carver say as much) and that he his programming requires that, should his identity be compromised, he kills those who know about it. At one point I wondered, given the heavy visual clues, and the fact that David chooses Caleb’s family to intrude upon (even given his promise, it seems remarkably convenient), if David would be revealed as Michael Myers in all but name; that he is Caleb, adding queasy subtext to scenes such as the ones where Anna (Maika Monroe) bumps into him coming out of the shower buffed and Laura (Sheila Kelley) is expressing her gratitude while hanging out the washing. That would probably have been a little too on the nose, but the invulnerable climax (stabbed, shot, but still he doesn’t go down) is completely Halloween, even if the fireman disguise is a standard thriller/serial killer staple (The Silence of the Lambs, Leon). Instead, Wingard lays down a strong Terminator vibe. For me, that’s the problem with the picture; it feels a little too much like a mash-up without ever quite ironing out the bumps and becoming its own unique thing. Scenes echo scenes we’ve seen before too strongly (even bad films; killing the gun dealer recalls The Jackal) and the marketers understandably fixate on the elements everyone is noticing (see the poster below). I found myself less than enthused by the middle section; while there are some well-staged explosive thrills once it shifts into action territory, the movie becomes much more obvious and less arresting. 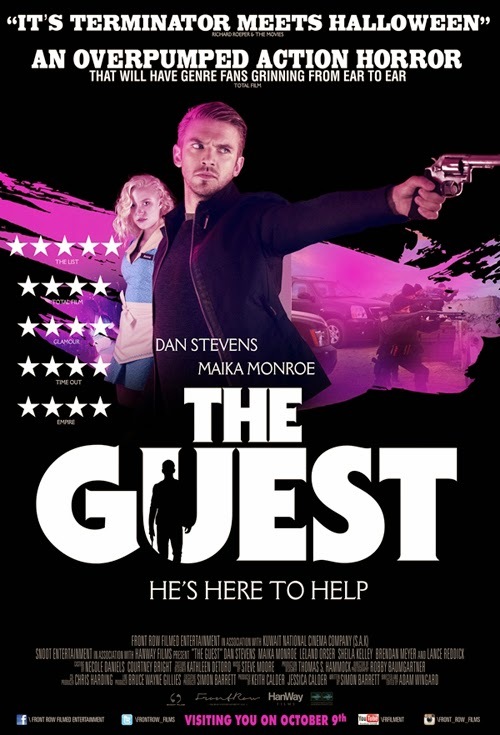 The Guest clearly enjoys shifting gears in respect of the kind of picture it wants to be; domestic drama, psycho-ville, conspiracy thriller, black comedy, retro-horror. How successful it is may be down to personal taste. The murder of Laura is a masterful “so this is where it’s going” turning point (“I really am sorry about this, Mrs Peterson. I’m afraid I haven’t been fully honest with you”), but, as David proceeds to waste all loose ends (complete with hand grenades at a diner), it becomes evident that Barret has constructed the flimsiest of motivations for his twists, and hopes that keeping things obscure will be an end unto itself. Ironically, since it’s the most homage-y it gets, the picture doesn’t quite right itself until the goofy horror trappings of the showdown, complete with ridiculously extravagant Halloween dance set, all endless passageways and dry ice. We know as soon as he is given it that Luke will end up putting the knife in David, but it can’t really be snooked at in a scene embracing conventions so fully (David even “dies” on graveyard scenery). As for the movie’s take on returned veterans, it’s window dressing really. Barret does highlight the assumed worthiness of many “War on Terror” films, however. There’s a crafty scene where David messes with the head of a stoner claiming he and his friends “support you guys” to which David responds with sudden intensity (“But you wouldn’t support us by enlisting”). Elsewhere, they even throw in the old “military intelligence” joke. The cast are outstanding, although Reddick could run through his role in his sleep. Maika Monroe, a young Gwen Steffani, keeps pace with Stevens measure for measure. Meyer is also strong. His reaction to David’s instructions on how to deal with bullies (go round their house at night and burn it down with their families inside) is priceless. Orser and Kelley add nuance to slim roles (Kelley in particular during the opening scenes) while Tabatha Shaun makes an impression as Anna’s best friend. I should probably give Wingard and Barret’s You’re Next a look, although horror isn’t really my bag. 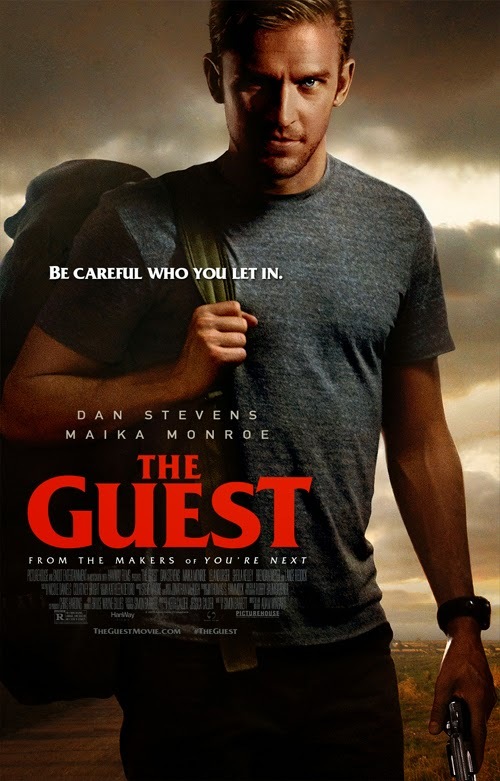 The Guest is a good movie made by smart guys, but they could do with wearing their influences on their sleeves a little less.